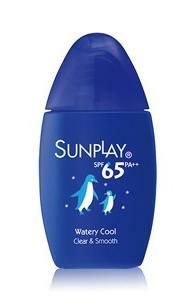 Sunplay Watery Cool SPF65 contains Menthol that provides a cool refreshing sensation. It has a Revolutionary Watery Liquid Formulation that gives you the protection that you need, without you feeling a thing! It is an easy-to-apply sunscreen with high SPF75 protection that repels harmful UV Rays away, so you stay cool and protected. It pretty light and absorbs quick into our skin. Its has got lil bit of refreshing menthol scent. Office lady, this would be something you would love alot!! Just so you know, the lighting in your office releases UV ray too. If you realise, even you were not out in the sun often but you deosnt seems to get fairer or maybe tanner?